A flavour that changes and improves with time by respecting the biological cycle of the fruit. A unique vanilla, 100% edible. Even the pod can be eaten! Reunion Island is The ultimate experience! All the great chefs love it! 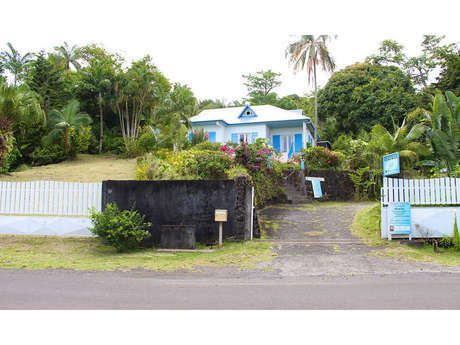 If you think you know everything about vanilla, head to Escale Bleue, in Saint-Philippe. There, like me, you will discover pods which are quite unique throughout the world. On Reunion Island there is a very particular vanilla which is the exclusive speciality of a couple in Saint-Philippe: Nicole and Aimé. We decided to visit them in their lush green wild South: Escale Bleue here we come! 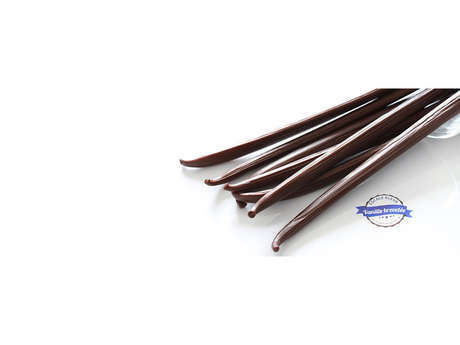 Saint-Philippe, at the foot of the volcano, is renowned for the quality of its vanilla. It is in Le Tremblet, one of the commune's hamlets, that we are greeted by Nicole and Aimé Leichnig. Their shop is easy to find, by the side of the road, not far from their plantation. 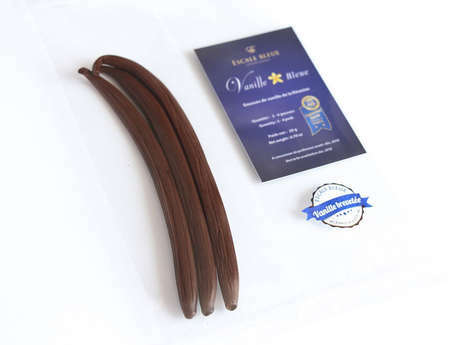 The founders of Escale Bleue have invented a completely new method of producing vanilla. The usual technique, developed a century and a half ago, here on Reunion Island, consists of blanching the green pods before leaving them to dry. The "blue" vanilla, as Nicole and Aimé have named it, is not subject to any cooking. After two years of ripening, the secret of which is jealously guarded, the pods are still alive, explains Nicole. They continue to improve, like a good wine, and are entirely edible as they're not very fibrous. They're good enough to eat! The aromatic qualities of blue vanilla have been recognised by great chefs, in France and elsewhere in the world. In Japan it is used to flavour tea. On Reunion Island it is used to flavour rhum arrangé, that we taste in the company of our hosts to end our visit to Escale Bleue: what an explosion of taste! Nicole and Aimé's shop gives a glimpse of the hundred and one uses of blue vanilla. The pods perfume jars of sugar or salt in which they are dropped and are even used in cosmetic products. Finally, their own invention, it produces a nectar which gives a delicious flavour to your dishes. We leave after doing our shopping, so happy to have discovered such a unique and incredibly tasty product.